**Guest post written by Nicholas Rubright of Dozmia. "Releasing music requires a huge amount of work, which makes it easy to miss something important. In addition to promoting your new release – sending it to radio stations, getting bloggers to write about it – there are some important things to take care of on the administrative side. Here’s a checklist of all the boring things you should take care of when releasing new music..."
**Guest post written by Katie Lott, Songwriting & Voice Coach, as featured in her blog Modern Songstress. 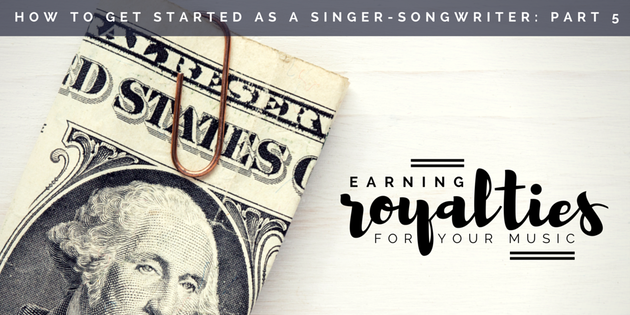 "So what the heck are royalties, and how do you get them? Royalties are fees that are paid to the composer (that’s you!) every time a song is played anywhere: radio, live venues, TV, satellite radio, internet radio, streaming services, etc." **Guest post written by Blake Morgan, artist, musician, record producer, and founder and owner of ECR Music Group. Originally featured in The Huffington Post. "I'm an American songwriter and singer. I first became a blip on the music advocacy radar when an email exchange between myself and the founder of Pandora, Tim Westergren, was made public in The Huffington Post. What lay at the heart of that exchange was that I'd gotten tired of billion-dollar tech companies lecturing musicians like myself about how hard those companies are working to "find ways to incentivize creators." Musicians know exactly how they could incentivize creators: they could pay us fairly." Be Safe, Protect Your Music! **Guest post written by Yannick Illunga of The Jazz Spotlight, as featured on The Jazz Spotlight. "If you ask artists if they are serious about their music career, most will answer affirmatively. Not many take care of the legal side of their career, though...Whether you’re about to graduate from music school or have been an indie artist for years, you can follow these simple tips that will avoid you huge legal headaches in the future." Demystifying The Music Industry: What’s The Difference Between ASCAP/BMI/SESAC and SoundExchange? **Guest post written by Dae Bogan, Music Industry Insider For The Indie Artist, of Dae Bogan Music. "A lot of indie artists are confused about the difference between ASCAP, BMI, SESAC and SoundExchange. I’ll attempt to break down the most important differences between these groups and elaborate towards the end about other considerations and other royalty collection entities."